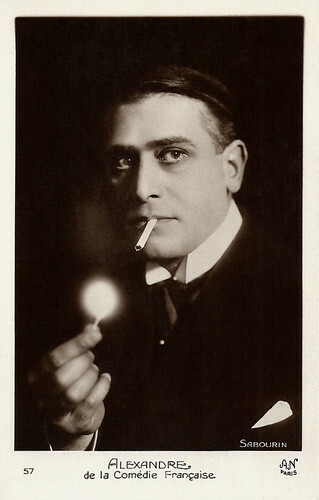 René Alexandre (1885-1946) or Alexandre was a French actor of the Comédie-Française. Between 1909 and 1940, he acted in some 53 films, mainly shorts by Pathé but also André Antoine’s rural drama La Terre (1921). French postcard. Photo Pathé. Platinogravure. René Alexandre was born in Reims, France in 1885. He studied at the Conservatoire as pupil of Paul Mounet and left with two first prizes for tragedy and comedy. 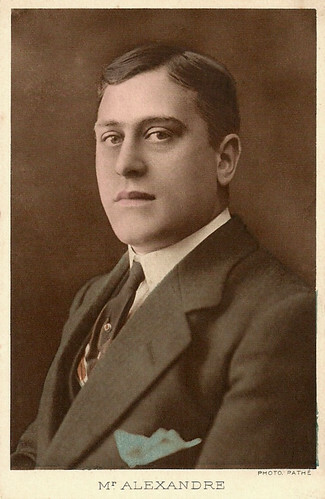 After performing in Ramuntcho by Pierre Loti at the Odéon theatre, he entered the Comédie-Française in 1908. There he was ‘sociétaire’ between 1920 and 1944 and became sociétaire honoraire in 1945. His repertory included the classics of Racine, Molière, Shakespeare and Victor Hugo, but also more modern authors such as Henri Lavedan, Paul Feerier and Henri Marx. In 1939 he would direct one play, A souffert sous Ponce Pilate by Paul Raynal. Alexandre was Chair and founder of the Association des Comédiens combattants. In Grosley-sur-Risle, where he was mayor in 1935-1940, he founded a home for actors who had fought in the First World War, like he himself had done. Alexandre was made Commander of the Legion of Honour. Between 1909 and 1940 he acted in some 53 films, of which 41 were short films for Pathé Frères. At Pathé, he started with Tarquine le Superbe/Tarquin, the Proud (1908, Albert Capellani), Le roman d’un geux/The romance of a geous (1908, Georges Monca), and Benvenuto Cellini (1908, Albert Capellani, Camille de Morlhon). 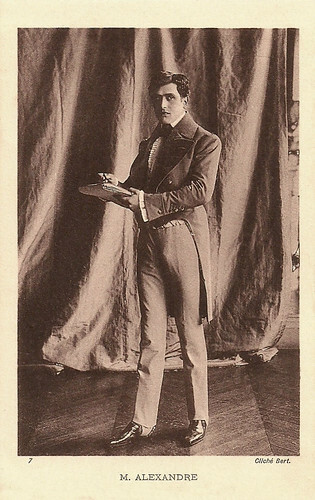 Alexandre acted in several historical films such as Fouquet, l’homme au masque de fer/Fouquet, the man in the iron mask (1910, Camille de Morlhon) in which he played the title character, and literary films such as the Victor Hugo adaptation Notre-Dame-de-Paris/The Hunchback of Notre Dame (1911, Albert Capellani), starring Henry Krauss as Quasimodo and Stacia Napierkowska as Esmeralda. 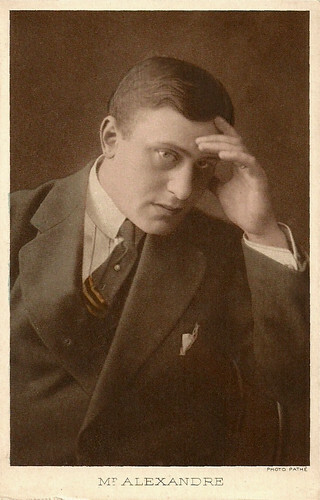 Alexandre mingled these genres with modern drama and comedy, such as Coeur de femme/When Paris Loves (1913, René Leprince, Ferdinand Zecca) with Gabrielle Robinne, and the second version of La Lutte pour la vie/Struggle for Life (1915, René Leprince, Ferdinand Zecca), again with Robinne. In 1912 Alexandre married Gabrielle Robinne, who was also a sociétaire of the Comédie-Française and film actress as well. Robinne was Alexandre’s partner in most of his films in these years, while another regular was Gabriel Signoret. In addition to Capellani and De Morlhon many other films of Alexandre at Pathé were directed by Henri Andréani, some also by Gérard Bourgeois. Besides the Pathé films, Alexandre also did sidesteps at Gaumont, such as Le mauvais hôte/The wrong host (1910, Louis Feuillade) and André Chenier (1910, Louis Feuillade, Étienne Arnaud). French postcard, no. 7. Photo: Bert. French postcard by A.N., Paris, no. 57. Photo: Sabourin. Because of the First World War Alexandre did not act for years. He retook his stage and screen career in 1919, e.g. with the Pathé film Le calvaire d’une reine/The Martyrdom of a Queen (1919, René Leprince, Ferdinand Zecca) with again Gabrielle Robinne and Gabriel Signoret. Impressive was Alexandre’s lead as Jean Macquart in André Antoine’s rural drama La Terre (1921), a modern version of William Shakespeare’s King Lear. Jean is the outsider looking for work, who gets trapped in the family war of Françoise (Germaine Rouer). Her uncle Père Fouan (Armand Bour) has decided to split up his belongings before his death, naively hoping to have an easy retirement, cared for by his sons and daughter. Antoine shot his adaptation of Emile Zola’s famous novel on the French countryside near Chartres, highlighting the beauty of it but also stressing the greed and cruelty of the inhabitants. Françoise is the only member of the family who is not despicable. Snow Leopard at IMDb writes: “It is a memorable and believable adaptation, helped significantly by Antoine's naturalistic approach, excellent location cinematography, and a cast that works together very well. Just as Zola's story does, the movie reveals a great deal about the darker side of human nature, with characters well- designed to bring home its points. It is a dark, often grim drama, but for all that it is very interesting and satisfying to watch.” Sadly enough, his lead in La Terre did not promote Alexandre to stardom in film. After La Terre, Alexandre only played in supporting parts in two silent films: Fleur du mal/Flower of Evil (1923, Gaston Mouru de Lacotte) co-starring Robinne, and Tu m’appartiens!/You belong to me (1929, Maurice Gleize), starring Camille Bert as an escaped convict who meets the beautiful adventuress Gisèle (Francesca Bertini). In the 1930's, Alexandre occasionally played supporting parts in films, such as the driver in the Georges Simenon adaptation La tête d’un homme/A Man's Neck (1933), starring Harry Baur as Maigret and Gaston Jacquet as the man who had his aunt killed to get money. The film was directed by Julien Duvivier, who had been Antoine’s assistant-director for La Terre. Alexandre’s last performance was in the film Paris-New York (1940, Claude Heymann, Georges Lacombe), in which he played a heartless banker. Alexandre and Robinne lived together in Grosley-sur-Risle. Alexandre died in Vitré, France in 1946. Sources: Films de France, Cine-ressources, Wikipedia (French), and IMDb.